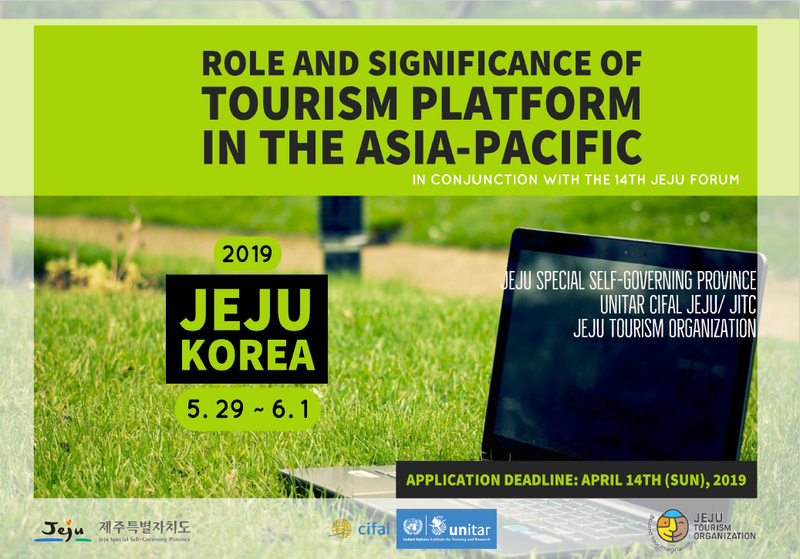 Jeju International Training Center (CIFAL Jeju) is delighted to announce the call for applications for the Workshop on Role and Significance of Tourism Platform in the Asia-Pacific. Please find the detailed Agenda and Application form attached to this post. On March 27th, 2019, Pacific Asia Travel Association (PATA) has announced that Airbnb co-founder, Nathan Blecharczyk, will be speaking at PATA Annual Summit 2019. This is an indication of how the Asia-Pacific, as well as global tourism, is changing due to the emergence of tourism platforms such as Airbnb. The importance of tourism platform, or so-called “sharing economy”, is being increasingly recognized by organizations such as UNWTO as one of the major emerging forces that are shaping the tourism sector. Due to the increasingly interconnected world fueled by technological advances, stakeholders are given more opportunities to utilize these platforms to improve and expand areas of tourism service such as information, accommodation, transport, food, and other activities. Granted, tourism platform doesn’t simply consist of digital platforms, but also traditional platforms that connects travel industry, communities and tourists. One such example is the Jeju Olle Trail, which has been connecting the local residents, nearby businesses and travelers by developing and maintaining walking trail around Jeju Island since 2007. The effectiveness of Olle Trail is proved by its sister trails in Kyushu, Miyagi, Mongol, and Yangpyeong. The remaining question is how to develop and maintain an effective, inclusive and resilient tourism platform that addresses the UN Sustainable Development Goals within the Asia- Pacific context. In this regard, this workshop invites prospective participants to explore and discuss the relationship between tourism and sustainable development within the context of platform development that makes both vertical and horizontal communication possible. Best practices on tourism platform development will be presented, offering opportunities to explore well-designed tourism platform cases around the world. There will be sessions to discuss good policies and practical tourism project developments in line with the UN SDGs. Finally, the workshop aims to aid participants in effectively developing relevant policies and projects for tourism platform, promoting and enhancing their capacity to address five key themes of the United Nations’ SDG framework- people, planet, prosperity, peace, and partnerships- in the long term. This workshop will be held in conjunction with the 14th Jeju Forum, “Asia Towards Resilient Peace: for Cooperation and Integration”. · Offer a venue for knowledge sharing and discussion and motivate participants to implement tourism platforms/ policies, with a particular focus on UN SDGs. · Coordinate partnerships to effectively promote the benefits of tourism with civil societies, government, and local entrepreneurs. Central/local authorities, representatives from NGOs, regional and community-based organizations, academic and training institutions and other local actors, who are working in the field of tourism within the Asia-Pacific region. a certificate upon the completion of the training. * Late application will not be accepted. · Participation is subject to the approval of the application by UNITAR CIFAL Jeju/JITC. · UNITAR CIFAL Jeju/JITC provides LIMITED financial assistance with the airfare to Jeju-do, Republic of Korea. · Local expenses (transportation, accommodation and meals) during the workshop period (only during May 29 ~June 1) will be covered by UNITAR CIFAL Jeju/JITC, except for arrival and departure days.